On July 30, 2012, American judoka Marti Malloy faced Italian fighter Giulia Quintavalle on the Olympic mat in London. Polished and poised in her blue judo gi, Malloy circled her opponent, her footwork fast, precise, practiced. In the seconds before she caught Quintavalle by the ankle, pinning her to the floor with both arms, her body appeared calm, quiet. It wasn’t until Quintavalle was on the floor and the referee called the match, inspiring a cheer from the crowd, that the audience could see the recognition on Malloy’s face: She did it. She won, becoming only the second American woman to earn an Olympic medal in judo—in two and a half minutes. Malloy,’10 Advertising, ’15 MS Mass Communications, ran from the orange mat to the sidelines, stopping to bow twice and shake her opponent’s hand before hugging her coach, Jimmy Pedro. She says that memory pushed her forward beyond the Olympics, driving her training while completing graduate school. In the years since that landmark moment, Malloy became the 2015 Pan American Games champion, qualified for the 2016 Olympics in Rio, and won the 2017 Grand Prix in Cancun. Malloy has been a professional judoka for 15 years—half her life. 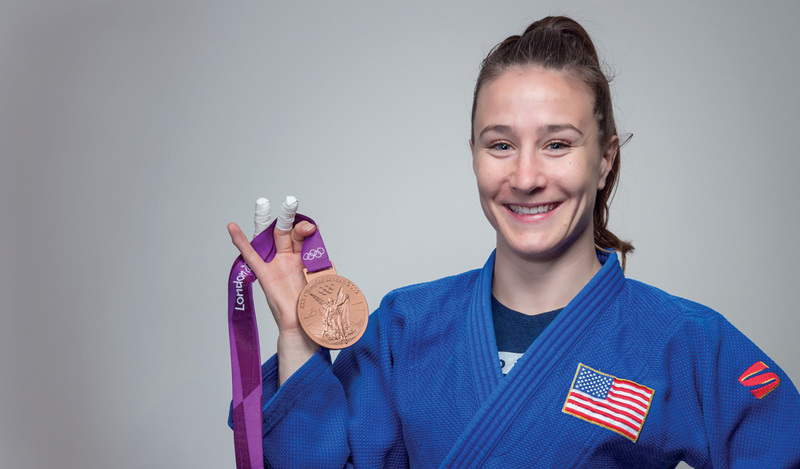 These are the stories that Malloy has shared with her fans and the judo fighters she has helped coach. But what exactly does it take for a young woman to become an international judo champion—and what has kept her motivated? Growing up on Whidbey Island in Washington, Malloy spent her weekends at the judo club while her peers were having sleepovers and pool parties. At 5’3 1/2″, she competed in the 57 kg category. So much of mastering the art of judo, she says, is to train your body and mind to react on impulse, and to make that reaction as effective and energy-efficient as possible. This means understanding your own strength—and trusting your body to react on instinct. The greatest reward, she says, is when her body outsmarts her mind, and all the hours spent practicing pay off with a magnificent, well-timed throw. She doesn’t need to look far to find a role model whose career in sports has often challenged existing social norms. Attracted to San Jose State by its world-renowned judo program, spearheaded by legendary coach Yoshihiro Uchida, ’47 Biological Science, ’04 Honorary Doctorate, Malloy was admitted in spring 2005. Though at 19 she had already traveled worldwide, the transition to college presented other challenges—like paying for rent. Her freshman year, she worked 30 hours a week at a sandwich shop in downtown San Jose while juggling a full course load and 16 to 20 hours of judo training a week. Difficult as it was to balance, Malloy says she gained valuable perspective from Coach Uchida. When she decided to join the ranks at SJSU, the judo program had 10 woman athletes—but by the time she enrolled, their numbers dwindled. Unfazed, Malloy often practiced by fighting both men and women. She acknowledges that while some male athletes might be physically stronger, half the fun of judo is developing a level of skill to outperform one’s opponent. As Uchida said of Malloy in a 2012 San Jose Mercury News article leading up to the London Olympics, “everybody respects her. She puts them in their place.” Uchida was at her side in London and again in Rio, when he was 96 years old. Only an inch shorter than her mentor, Malloy’s respect and admiration for Uchida are underscored by the sport’s core values, which are reinforced in every practice and at every competition. Fighters bow to each other before a match as a sign of respect, and the sport emphasizes “the gentle way,” a thoughtful manipulation of energy. Occasionally, Malloy would encounter male counterparts who underestimated her. Supported by Uchida and Assistant Coach Mike Swain, ’85 Business, the first American world champion, four-time Olympian and Olympic bronze medalist, she was unafraid to challenge assumptions about her gender, strength or size. Since retiring from competition in August 2017, Malloy has traveled the world teaching judo seminars. Though she will always be connected to the judo community, she is ready to establish roots and apply what she’s learned to the world at large. As the social media manager for MyHealthTeams, a startup that serves people living with chronic conditions, she manages 58 social media profiles, representing 28 conditions on two platforms. In other words, the Olympic judoka is still strong, adaptable, strategic—and giving back to a community larger than herself. Marti Malloy’s story represents a long tradition of outstanding woman student-athletes at San José State. From Olympic swimmer Lynn Vidali Gautschi, ’76 Kinesiology, ’77 Teaching Credential, to record-breaking gymnast Thomasina Wallace, ’12 Kinesiology, generations of Spartan women have led successful careers in sport. Read The Women in Sport Stories.